Surrounded by dense forestry, slope down to another miracle of nature in Kefalonia’s subterranean world and let your footsteps guide you to the cave of the nymphs. Beautiful waters with changing shades of blue as the sun sets, honey-like brown walls and countless stalactites will take your breath away and travel you to another, mythical and magical world. In the 1962 excavations, quite a few oil lamps, plates and figures were discovered depicturing the god Pan and several nymphs. Legend has it that the Cave of Melissani was the very spot where one of those Nymphs, Melissanthi (or Melissani), drowned after being rejected by the god Pan. Melissani cave-lake gives off a rum appeal, as inside the ‘B’-shaped cave is a lake that has a small island, as well as trees and forests surrounding it. Its two chambers, one sun-lit and the other dark and ominous covered with stalagmites, algae and moss, create a unique and unforgettable picture. 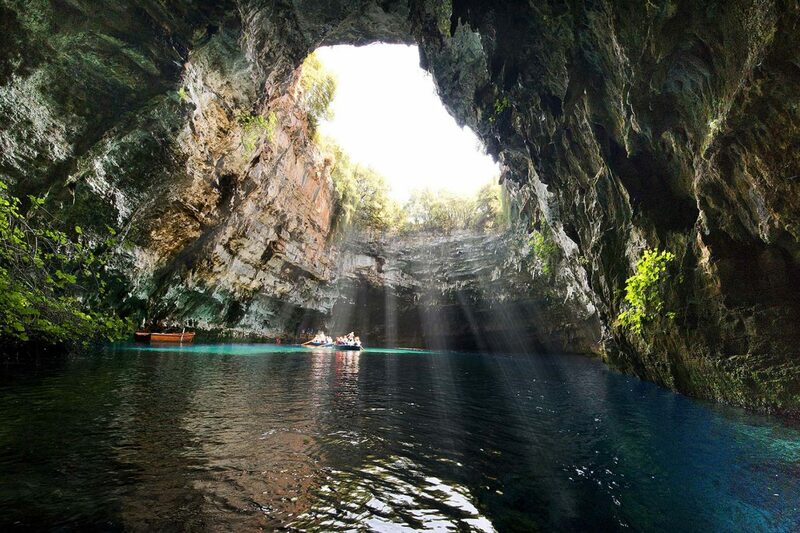 Given the chance you shouldn’t miss visiting the Cave of Melissani, a memorable sight that leaves one in awe. The 3 star hotel Melidron offers genuine Greek hospitality in an elegant, simple and cozy environment. Kindness and neatness are the hotel’s main ingredients.